The severe weather threat is OVER for the majority of Central Alabama. A strong line of thunderstorms pushed through and is now tracking into Georgia. The severe weather threat continues for South Alabama. But, Central Alabama is ALL CLEAR. While the tornado threat did not materialize, winds meeting severe thunderstorm criteria caused numerous damage reports. There have been multiple reports of trees down across West and Central Alabama. Power has been knocked out for thousands. And there have been a few reports of trees on homes. Join CBS 42 for complete storm damage coverage tonight at 10 p.m. 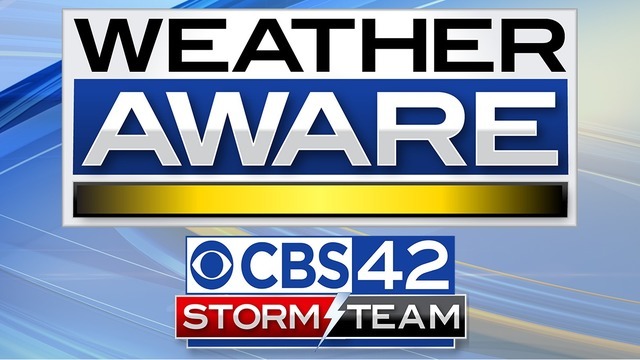 If you do not have power, you can stream the newscast from the CBS42.com homepage. Showers will hang around for Friday as the low pressure area and cold front that bring the storms exits slowly to the east. Cold air will also enter the picture for the end of the week. Expect a shock to the system as highs only reach the upper 50s and low 60s with a strong northwest wind. The cooler air hangs around as we start Easter weekend. Temperatures will sit in the low and middle 40s for Saturday morning with highs only in the low and mid 60s. Easter Sunday looks warmer and sunny with nice weather continuing into the start of next week.